A baby boy has survived a life-threatening form of the herpes virus that doctors say was possibly caused by a kiss. 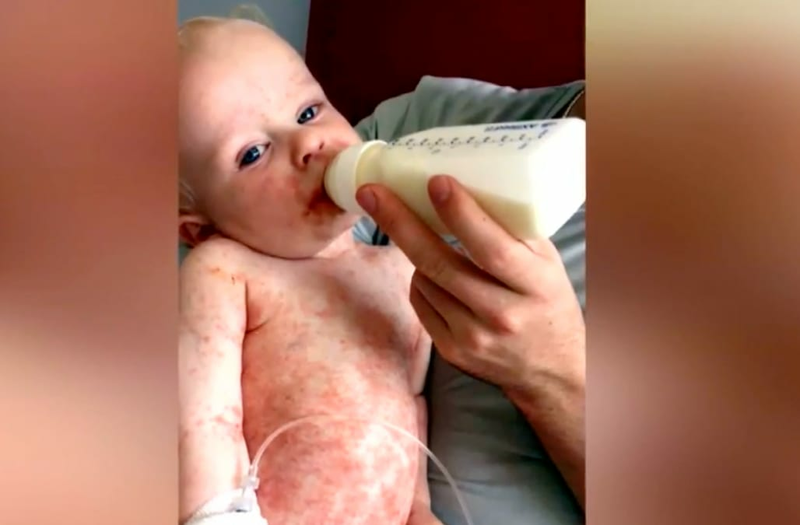 Maria O’Neill, of Derry, Northern Ireland, said after her 16-month-old son, Parker, contracted the virus in August, his temperature soared and a rash crept over his body. When she took him to the doctor, she said they gave him cream for the rash. "I just felt there was something else behind it," she said. "The rash didn't look normal... Every time the doctors turned me away it seems to get a lot worse, so my mother’s instinct kicked in and I knew there was something more to it." When he started developing blisters over his body, she rushed him to an emergency room, where he was put on a drip. Doctors diagnosed him with a strand of the herpes virus. "We are lucky we caught it in time," she told InsideEdition.com. "It was very scary." Parker had to stay in the hospital for a week and was put on three different antibiotics and an antiviral medication. While Parker is finally recovering, his body is scarred and he suffers from eczema, his mom said. She puts cream over his body every day and puts special bandages on his skin at night. "They said his blood changes every seven years so it could just go away or it could flare up if he’s run down," she said. But she told Caters News that she knows they're lucky; if he had caught the virus as a newborn, it could have been deadly. While it's unclear exactly how Parker contracted the virus, doctors suggested it could have come from a kiss or from someone who previously had a cold sore. His mom is still not sure who may have given it to him. "I don't even kiss him on the lips or anything," she said. "Maybe he got it in passing or someone touching him... Maybe it was one of the playgroups he was at." Still, she wants to give other parents a warning. "Don't let anyone kiss your baby," she said. "Don't let anyone near your baby if you have a cold sore."